Ted Riser has covered a lot of ground over the years – not just in miles, but in musical accomplishment. 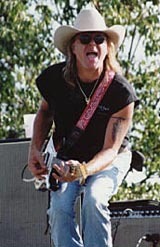 Sure, he’s rocked packed audiences – time and time again -- at major national events from Sturgis to Myrtle Beach to Durango to Laconia to Daytona Beach. That’s where fans expect a lot more than "toe-tappin’ music." Those crowds expect full-throttle, high-octane, foot-stompin’ performances. That’s what they get from Ted Riser, and that’s why he keeps getting invited back. But different audiences, especially at more up-close, personal venues like the House of Blues or private parties at the Kentucky Derby, expect musical versatility -- a range of memorable sounds and moods that run from the gentle strains of "Sweet Melissa" to the soulful, down-home wails of "Can’t You See" and the wistful "Comes a Time." Those are the songs of the Allman Brothers Band, the Marshall Tucker Band, and Neil Young. Three legends. Three distinctive styles. All brought together in an unforgettable “Triple Tribute” performance produced, presented, and headlined by one masterful musical artist: Ted Riser. Surrounded by some of the best musical talent in the business, Ted doesn’t just play Neil Young. His "Hurricane" act is Neil Young, complete with Ted on guitar and harmonica. "Whipping Post" isn't just an Allman Brothers tribute band. It is the Allman Brothers, all the way from Gregg’s vocals to Dickey Betts' licks to Duane's crazy, blistering riffs. And "Long Hard Ride" is Marshall Tucker, with flute accompaniment inspired by Jerry Eubanks and the blend of vocals, lead guitar and bass that set Tommy and Toy Caldwell apart from everyone else. Ted's been playing their music since the 70's all across the country, building an indisputable reputation as THE man who can do it all. And, in the past few years, he's attracted a handful of top-notch musicians who become those legendary performers on stage. Out of respect and love for his musical heroes, Ted calls it a "tribute." To countless fans all across the country, it's more of a re-incarnation of styles and sounds that will live forever. 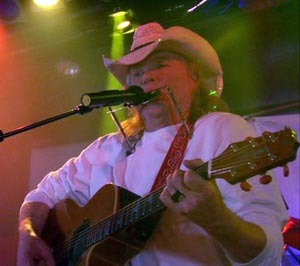 Ted's written hundreds of songs and performed thousands of times, doing everything from classic rock to blues to jazz to country. Whatever instrument he's playing – usually guitar – it becomes an extension of his musical soul, an effortless flow of melody, harmony, rhythm and song that grabs an audience and won't let go. He's been doing it since age nine, when his mom introduced him to her piano and his dad let the boy try out his harmonica. Mom's music was influenced by the Big Band boogie woogie sounds of Tommy Dorsey, Count Basie, and Glen Miller. And dad shined with his own harmonic renditions of beloved campfire songs. But, as a kid growing up in the 60's, Ted's strongest influences were more contemporary – and serious. He spent some time at Kent State University, but left there at the age of 23 to take on the real-word challenge of perfecting his craft by starting his own band, Southbound. No surprise to anyone, he was doing Allman Brothers music in those early years. Ever since, his craft and talent have evolved into artistry, and he’s been performing non-stop from coast to coast. Northeast Ohio is still his home, but the appreciation and demand for his music has no boundaries. He still covers a lot of ground every year, touring nationally, reuniting with old friends who can’t get enough – and making new friends who can’t wait to see him again.